In August many events which had been planned still took place, e.g. on 3rd August Balls Park garden was open to the public; and on the same day (Bank Holiday Monday) Bengeo Flower Show took place in the rectory grounds. However much of what was happening in the town related to the preparations for war. 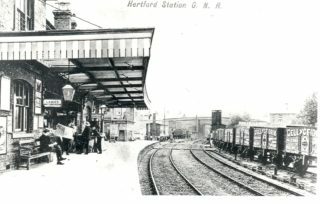 The Mercury editor wrote about “The German Menace” and went on to say that Hertford in the first week of August gave the appearance of an armed camp. 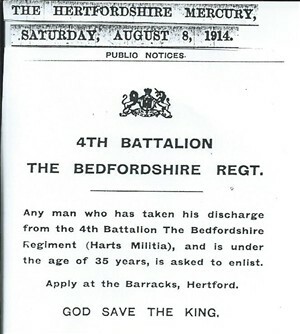 The 4th Battalion, Bedfordshire Regiment, (Herts Militia), requested that discharged and under 35s enlist by applying at the Hertfordshire Barracks. At the headquarters of the 4th Battalion, Hertford Territorials and Yeomanry there was a constant influx of companies. Every one of the 134 yomenry reported for duty and recruits “poured in.” Several old yeomen re-joined. The men were billeted on various local public houses. The Mayor, H. Page-Croft, M.P. talked about the splendid response of the territorials to the summons to report and the enthusiasm of all ranks. Many “pathetic leave-takings” occurred where wives, mothers and children were weeping as they took their leave of their men folk. This was probably caused by a combination of fear for their men and worry about how they would fare in the meantime with no steady wage coming in. The soldiers on their side were as light hearted as though they were going to a picnic, perhaps a belief that they would not be at war for very long or just plain bravado. Mobilization of the County Forces caused “stirring scenes in Hertford,” and the town “presented the appearance of an armed Camp.” After an order received on 4th August, 1st Battalion, Hertfordshire Regiment struck camp at Ashridge Park where it was on manoeuvres. After a mobilization order, that evening most of the men reported at their company headquarters and received preliminary orders. The following day, men were billeted at the Corn Exchange, Salvation Army Barracks and All Saints’, St. Andrew’s and Cowbridge Schools. Later that day 100,000 rounds of ammunition arrived from the Hyde Park Magazine and were stored in the drill hall at the bottom of Port Hill. The streets were filled with civilians and military. With no less than 980 men mobilized the town had an animated and martial appearance. Men scoured the area for horses using the gentry’s motor vehicles. Stabling at McMullen & Sons in Port Vale was requisitioned. A £5 note was given as a bounty to each territorial who volunteered. This was probably the first time many had seen these large white £5 notes. This money was meant for their wives and dependants. I wonder how many received it? How much disappeared in drink, drunk by the men sharing in camaraderie with their pals? On arrival the men were all provisioned for the day. After this they had to be fed from local supplies, and the shopkeepers had unusual demands made upon their stocks. The bakers especially, owing to the suddenness with which the orders were sprung upon them were given an anxious time but with commendable promptitude they proved themselves able to meet the demands of the military without putting their regular customers to any great inconvenience. On Sunday, 9th the Yeomanry paraded early at St. Andrew Street, HQ and by 9am had moved off towards Ware under the command of Colonel Abel H. Smith. The Mercury arranged to be supplied with news from Reuter’s War Service in order to report on the “whole theatre of war by land and sea”. An amusing incident which could have had serious consequences occurred on the Thursday, 6th August. The men were all up early in the morning unable to sleep perhaps with excitement and trepidation. By 7am they were parading on Hartham. Each man was given 150 rounds of ammunition. The cardboard boxes in which the ammunition had arrived was piled up on the common and burned. Unfortunately there were a few cartridges left inside the boxes and towards evening as the heat of the fire increased, these cartridges exploded. Fortunately no injuries were sustained. 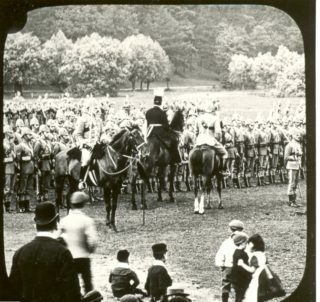 During that Thursday 60 horses requisitioned from businesses across the district were paraded. Those which passed a veterinary examination were billeted whilst the others were returned to their owners. On Friday, 7th August, 1st Herts Regiment paraded at Hartham at 2.30pm and then through the streets which were lined with crowds. The men attended a service to lodge the colours at All Saints’ Church. The advanced guard left later that day with the rest of the regiment entrained at the Great Eastern Station on the following day. On this same Saturday, (8th) 4th Battalion Bedfordshire Regiment (Extra Special Reserve), also referred to as the Herts Militia, mobilized at the London Road Barracks under the command of Lord Salisbury. Over 500 strong the Battalion marched to the Great Eastern Station to be entrained and departed just after 9.30pm. The watching crowd sang the National Anthem. On Saturday, 8th Messrs E.E. Pearson & W. Graveson, two fo the County Magistrates, swore in fifteen special constables and this was followed on the following Friday by a further 25 being sworn in by Messrs. W. & E. Graveson. If called upon they could expect to be on duty for a minimum of three hours out of 24. On Monday, 24th a further 100 men were sworn in as special constables at the Shire Hall. They were reserves in case of riot or disturbance. They might be asked to guard water supplies, viaducts, railway bridges, to arrest aliens, protect life and property and to keep and preserve the peace. They were entitled to arrest without warrant anyone suspected of a felony, murder, manslaughter, slander, sacrilege or wilful damage. Many of these specials were leading tradesmen. 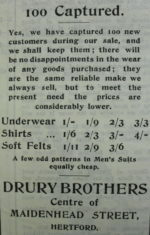 Margaret A. Smith, wife of Reginald Smith of Goldings, explained in a letter to the Mercury that she would be holding working parties every Tuesday, Thursday and Friday, from 10am to 5pm in order to create garments for service men. Any lady who could help would be welcome and she should bring a sewing machine if possible. The aim was to produce pyjamas, night shirts, pillow-slips, etc. Also she understood that knitted socks were in short supply. Any contributions to the cost of materials would be greatly appreciated. It was harvest time and, of course, in those days such time was very labour intensive with very little if any mechanical aids to assist in the activity. Many of the farmers’ men who had been reservists had now joined up, so the farmers were short of help to get the crops in. Frederick A. Hawks, 46 Queen’s Road, had decided to create a list of men willing to assist in getting in the harvest and supply this to the farmers. Amongst all these changed circumstances and preparations for war some things continued as usual. Messrs R. Courtney, Eldon St, London EC, was advertising and offering emigration to Victoria, Australia, for thoroughly experienced farm workers. Married men with grown-up families could also apply as could boys 16 – 21 with or without farm experience. 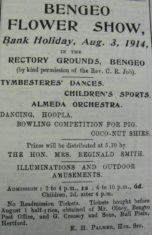 This advertisement appeared in the paper at the beginning of August so presumably it was arranged before war was declared. 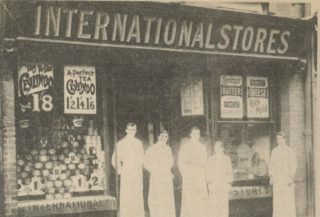 By 15th August International Stores, which claimed to be the biggest grocers in the World, advertised that business was proceeding on a normal basis. 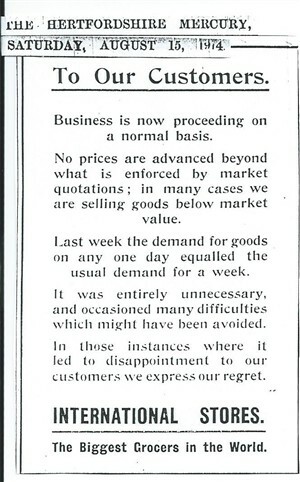 No prices were advanced beyond what was enforced by the market and in many cases the shop was selling goods below market value. The previous week the demand for goods on any one day was equal to the usual demand for a week. This was unnecessary and occasioned many difficulties which might have been avoided. By the middle of the month, unemployment was a problem. The building trade, which had been suffering anyway, was apparently hardest hit with many existing contracts broken and no new ones materialising. One contractor had dismissed 30 employees and put his remaining staff on half-time working. Three funds to support people on the home front had been established; a national one after an appeal by the Prince of Wales; a County one organised by Lord Clarendon, Lord Lieutenant of the County; and one organised by the Mayor for local support. A Relief Committee was formed in the town and at a meeting on Monday, 10th August at the Shire Hall it was decided that donations would be used initially for local necessity both for the relief of the families of men at the front and for those seriously affected by loss of employment. However it appears that the committee members did not trust those who might benefit from this fund as they decided that benefits should be given in kind or with tickets and not cash! A number of ways were suggested for people to give assistance – by giving employment; by donation to the fund; by a contribution of a sum of money on a regular basis, e.g. each week or month; a contribution in kind; and by personal assistance in the work of the committee. Later the town was divided into 30 districts with collectors appointed for each. Weekly donation cards were produced and given out by the collectors. A Hertford division of the Soldiers’ and Sailors’ Families Association was established with Theodore Barclay as its treasurer and secretary. The Hon. Reg. A Smith represented the association in Hertford, Lady Longmore in Christ Church Parish and Miss Margaret Smith in Bengeo. Wives and families of soldiers and sailors, including reservists and territorials, throughout the county could apply for assistance. (During the Second Boer War, 1899 – 1902, 200,000 cases had been helped to the sum of £1,205,000, estimated to be £125,527,983 in 2014!) The Association expected to get help from The Prince of Wales’s and Lord Lieutenant’s Funds. By 22nd it was reported in the Mercury that £780.17s.1d had been donated to the Mayor’s Fund. £100 of this had quickly been given to the Soldiers’ and Sailors’ Herts Association for distribution. He went on to say that more than monetary assistance is required. In the current situation people should subordinate personal ends to the common weal. As Wordsworth had written in “Character of a Happy Warrior,” the man who though he ‘go in pain and bloodshed’ yet ‘Turns his necessity to glorious gain.’ They must triumph over the difficulties and cultivate a spirit of neighbourliness. Towards the end of the month the licencing authority decided that public houses would be closed an hour early at 10pm. This had been requested by the Chief Constable and religious bodies. With so many troops in the town there were many lively scenes which it was hoped to reduce by this reduction in drinking time. (There was one licence for every 148 persons in the town including children). It was also recommended that clubs should make the same change. This change caused much unhappiness in the licenced trade which felt it was being discriminated against. Letters both for and against the measure were published in every edition of the paper until the editor called a halt to the correspondence in October. At the Hertford Borough Sessions, two brothers and another man were arraigned for not paying “out-relief” to the Union Workhouse for their mothers. Colonel B.J. Gripper stated that the Voluntary Aid Detachments were fit for service and would be commanded under the Territorial Force Association. He had raised 7 to 8 detachments of men and about 20 women’s detachments. They were likely to serve as ambulance trains, assist at base hospitals or possibly convalescent homes. Supplies would be provided by the Red Cross but funds would be provided. 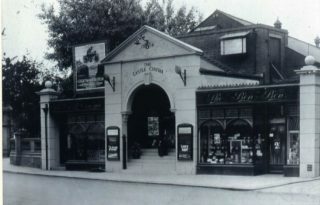 At the same time the People’s Electric Theatre, Maidenhead Street on the corner with Bull Plain, was showing “”Fantomas” the fifth episode of a Master Crook and was advertising that the latest war news would be shown on the screen as received from London. East Herts Musical Society previously planned ordinary concerts were suspended and were replaced by singing sacred music in All Saints’ Church. Mr. G. Wagstaffe Simmons, Hon. Secretary Herts. F. A. was determined that football would continue through the autumn. However receipts from any matches in August should be given to the Prince of Wales Fund. Further F. Melton, St. Albans F.C., suggested that clubs with shortages due to call ups could amalgamate. The Hertford Millenary Pageant which had been supported with great enthusiasm did not as previously expected break even. Mr. W. Graveson wrote to the paper stating that there were problems with the finances after unexpected calls on them by people whom it had been assumed would give their efforts free. The deficit was estimated at £350 and so it was likely that guarantors would have to pay 3s 6d in the pound to cover this deficit. However on the bright side a collection amongst the pageant performers resulted in a gold watch being purchased and sent to E.H. Oram who had been the stage manager of the event. There was a call for old hay from farmers by Director of Army Contingency at the War Office. Hertfordshire being positioned as it is, many troops passed through the county on the way to the South Coast or to training camps in the east. Large numbers were billeted in the towns, often just overnight and at one point towards the end of the month there were 1500 troops billeted in Hertford with over 500 horses left to graze on Hartham. 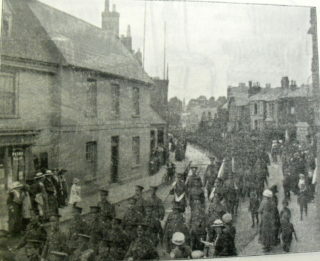 500 mounted troops of Bedfordshire Yeomanry were billeted on straw in the Shire Hall & the Drill Hall in St. Andrew Street, although some preferred to bivouac by their horses on Hartham. 1000 infantry of the Gloucesters and other territorials were billeted in Port Vale & Bengeo. Four men found in the street because they could not abide their billet were taken in by neighbours. One lady was so scared that she might have men billeted on her that she pulled down her blinds and locked her doors and gate to give the impression she was away. One well-to-do lady asked for men rather than officers considering that men deserved just as good accommodation as officers. However another lady only wanted officers. Those who were found to have accommodation having claimed they did not were given a “double dose”, ie. double the men to accommodate. House occupiers were offered 3s 4½d per man for 3 meals and lodging overnight. The sum actually given was 1s 9d! Hopefully these troops left the town reasonably quickly as it was reported that yet a further large number of troops was expected in the next two to three days. Apparently the 3rd Battallion Royal Warwickshire (Territorials) contained many men who were footsore from being marched around the county to be hardened up! I’m sure many of these men were regretting having volunteered. The Mercury considered that the men would have been better served training in a camp. There were now complaints about uneven billeting across the town. Some people with big families were given large numbers of men whilst those with plenty of space sometimes found themselves with no one billeted on them! One down side of billeting large numbers of men was illustrated by a case brought before Hertford magistrates towards the end of the month. Ernest Trowman, a tin smith from Birmingham was sentenced to 3 months hard labour for stealing a watch and chain and pendant as well as a pair of slippers which were the property of Annie E. Pilcher, Villiers Street with whom he been billeted over-night. In late August, 1,500 men of the Royal Berkshire Regiment marched through the town to Ware, with a swinging step, singing and cheering. The Editor, “Poultry World” was offering a free month’s instruction in poultry keeping as a way of increasing the food reserves. Meanwhile it appears that people were concentrating on the present and not concerned yet with the autumn, since, C. Adams & Co., Old Cross Wharf, advertised that it saw no reason to advance household coal prices. Great Northern Railway seems to have expected people to go on holiday in spite of the war as it was still advertising express excursions to Scotland (7 – 17 days) and the Yorkshire coast (3 – 17 days.) It was also advertising one day excursions to Kings’ Cross. Three boys, two 13 years old and one 10, were found guilty of stealing eggs from G. E. Palmer, Revells Hall. These offences had been repeated continually in spite of Mr. Palmer remonstrating with the boys. (Perhaps they were hungry?) They were also responsible for stealing fruit. One, presumably the ring-leader, was given 6 strokes with the birch and the other two four stokes. Telegrams and radio telegrams would now only be accepted in English and French and would be subject to censorship. Names and addresses had to be written in full. Towards the end of the month, Nurse R.S. Gallon who had worked for some years at Hertford County Hospital was in a party of 20 English nurses who left for the front. Clearly not interested in the war, or perhaps to get away from it, The Hon. Mrs. Bevan announced in the Social & Personal section of the paper that she had left London for Scotland. Hertford PSA (Pleasant Sunday Afternoon) Brotherhood collected for £1.11.6d for the brotherhood War Distress Fund. This movement was started by John Blackham and friends at the Ebenezer Congregational Church in West Bromwich to give men something to do on a Sunday afternoon. It quickly spread throughout the country. 1 A guinea was a coin worth £1.1s.0d and was the currency used by well-to-do people. This page was added on 08/06/2013.